An API-based architecture is essential to agile delivery of mobile applications. 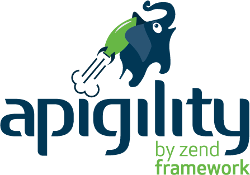 Apigility provides JSON representations that can be parsed and used in any mobile framework; write for the web or native applications simultaneously! or install in your terminal without download, as documented below or in the installation documentation page. Want an overview of the Apigility features? RESTful or RPC services; JSON (specifically, HAL); Problem Details for HTTP APIs; Versioning; Normalisation and Validation; Authentication (HTTP Basic/Digest, OAuth2); Documentation (HTML, Swagger, API Blueprint).